This post was originally published by Boyd Neil on his personal website on May 4, 2015. 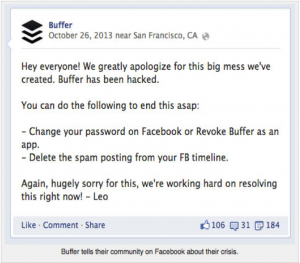 Apologies are now the norm when it comes to social web screw ups. Unfortunately, they are not always done well. There are the good ones that will have the hoped-for effect: reputation protected, customers and regulators appeased. Then there are the weasel-worded apologies that fool no one but executives who fear the bogeyman of some non-specific ‘liability.’ (Mari-Li Pitcher offers a great personal list at PuckerMob). With humility, let me suggest a basic taxonomy of offensive corporate non-apologies that should be pinned to the desktop of anyone who might have to write one for their company …with a big ‘DON’T DO THIS’ sign hanging above them. An offshoot of the ‘shift-the-blame’ attempt at atonement is expressing sadness at the impact of an action without somewhere in the apology acknowledging responsibility or committing to fixing whatever happened. This type of apology, couched in sincerity, is an attempt to avoid specific culpability, sometimes by blaming others when the organization has also had a part in the events, or by a generic ‘misunderstanding’ statement. Pointing at a problem only tangentially related to the main social web crisis event is an especially tricky avoidance gambit. It can take many forms: apologizing for something other than what you really did or by following a sincere apology with an attempt to direct people to a more general matter. Buffer apologized for being hacked. They were the victim, but they recognized that being hacked wasn’t of concern to its customers—only the fact that they had been inconvenienced. And their apology was personal and heartfelt, and included a commitment to action as soon as possible.